This surprise evening will divinely and organically unfold as Dr. Williams leads the way with no topic in advance. 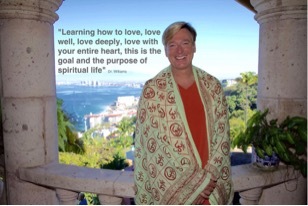 Dr. Williams is a nonphysical entity of pure consciousness and love. He is not limited by the boundaries of human consciousness, human psyche or the human ego. It is this that makes him a unique, inspiring, and powerful guide. Dr. Williams assists people who are looking for liberation. Each individual’s life circumstances are unique. He assists us to go beyond the small self and gives us valuable tools for personal transformation. He helps us to think outside the box. Dr. Williams draws from topics that include spiritual psychotherapy and the philosophy of the great yogis, in addition to quantum physics, metaphysics, neuroscience, parapsychology, and the nature of reality, all inter-connected to broaden our limited perspectives and assist us to move forward in our lives. Bart Smit has a rare gift wherein the spirit of Dr. Williams is permitted to come forward while Bart is in a deep state of trance. Bart is the only channel for the spirit of Dr. Williams. Bart and Dr. Williams are of the same light, yet they are distinct and separate personalities with different mannerisms, accents, and vocabularies which have evolved over their 25-year partnership. Join us for an intimate evening of profound discussion with Dr. Williams as he bestows his wisdom. To register or inquire further, please call us at (905) 844-5055 or send us an email. © Since 2007. Akasha's Den | All rights reserved. If you can’t make it to the Den…or just prefer to experience a session in the comfort of your home…these services are also offered by distance: Birthdate Signature Readings; Divine Angelic Heart Healing; Huna Healing; Oracle Card Readings; and Reconnective Healing. Contact us for details.